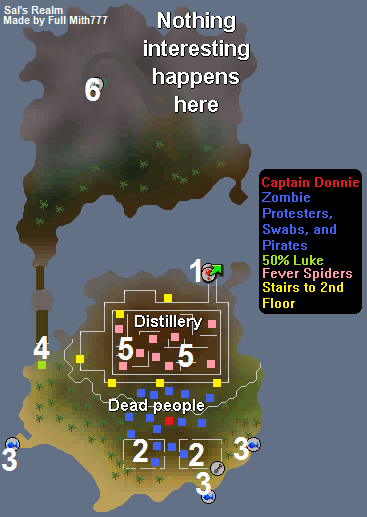 Braindeath Island is primarily used for the Rum Deal quest. It also plays a role in the Rocking Out quest. Other than for the quests, there aren't many reasons to take a visit. However, Braindeath is the only place where Fever Spiders can be found. As you wander around the island, you'll get the idea that people here love rum. Seriously. 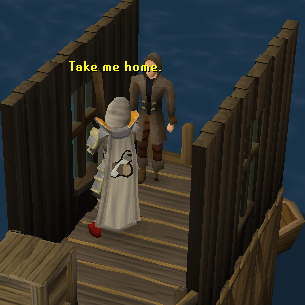 Note: The only way to get to the island is to talk to Pirate Pete. 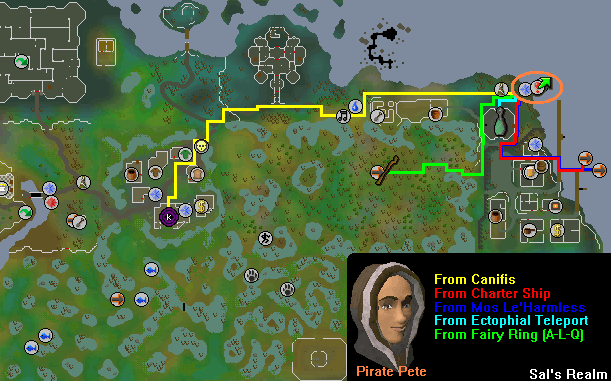 The methods below show how to get to Pirate Pete, not the island. Also keep in mind you must have started Rum Deal to get to Braindeath. Simplest route, find a way to Canifis. From there, head east past the farming patches until you reach a dock. On the dock should be Pirate Pete. Talk to him and reply with 'okay'. He'll tell you to look behind you because apparently something is there, but he'll knock you out instead. The Fastest route is to teleport using your Ectophial (must've completed Ghosts Ahoy). Once there, head northeast to the dock. Speak with Pirate Pete from there. A more costly route would be to take a Charter Ship to Port Phasmatys. From there head to the gate to exit Port Phasmatys. Go northeast to the dock and speak with Pirate Pete. If for some reason you happen to be on Mos Le'Harmless, you can head to the ship with Bill Teach on it and right-click travel on him. From there, you'll be just east of the Charter Ship in Port Phasmatys. Now head to the gate to exit Port Phasmatys. Go northeast to the dock and speak with Pirate Pete. The final method is the most dangerous. You can use the Fairy Ring code A-L-Q to get to the center of the Haunted Woods. From the ring, go east to the walls of Port Phasmatys. Then go northeast until you reach the dock with Pirate Pete on it. Speak with him. Pirate Pete will take you to and from the island. However, he must always knock you out before you go, so you don't know where the island is. These patches are only for the Rum Deal quest, don't be fooled by the farming icon on the map. 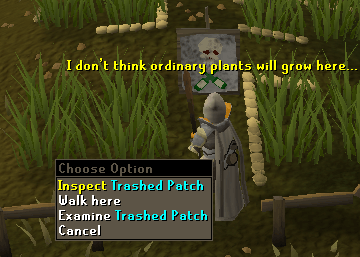 During the quest you plant Blindweed here, I mean what else are you going to grow on trash? During Rum Deal, you'll be given a fishbowl and a net which you need to tangle together to catch Sluglings. You are unable to do this after the quest. 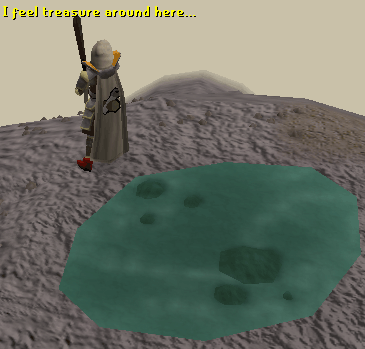 You can also catch Karamthulhu in these fishing spots. 50% Luke stands watch to make sure no one passes the gate. Luckily, he's just as gullible as you and falls for the 'look behind you' trick and you can walk on through. Fever Spiders are located on the ground level of the Distillery. 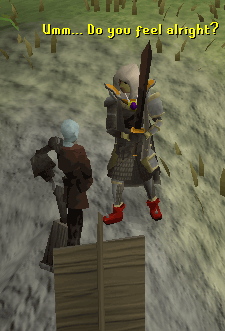 Fever Spiders (Level: 49) need 42 Slayer to kill and you need to be wearing Slayer Gloves as well. 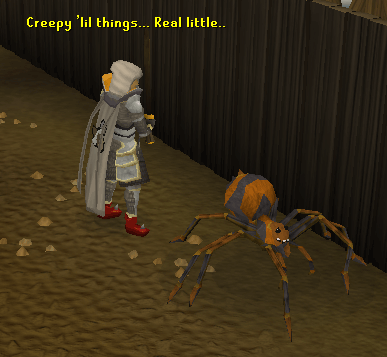 Braindeath Island is the only place where Fever Spiders can be found. 50% Luke was told by Captain Donnie to make sure no one passes the gate to the other side of the island. However, you can easily trick him and get by. When you talk to the Brewers, they seem to be overreacting to the whole zombie situation. Offers you 'fresh-ish' rum. You simply reply with 'No thanks'. 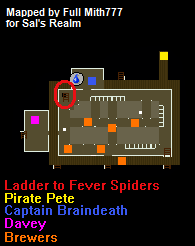 Seems to be doing well after the quest, but is acting quite suspicious..
Pirate Pete will take you to and from Braindeath Island, but, he won't let you ride consciously. Clearly wants rum. The Protesters will offer you a drink, but you find an excuse. The Evil Spirit is the boss monster in Rum Deal. The Evil Spirit was possessing the brewing control, so you had to kill it. Found in the basement, or ground floor, of the Distillery. 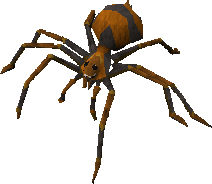 Fever Spiders are killed at 42 Slayer while wearing Slayer Gloves. 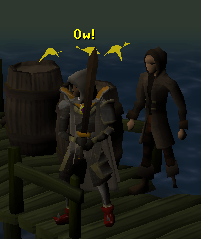 Plain old Zombie Pirates. Can be killed for several different drops, nothing special. 100% drop bones. Pretty much like Zombie Pirates. 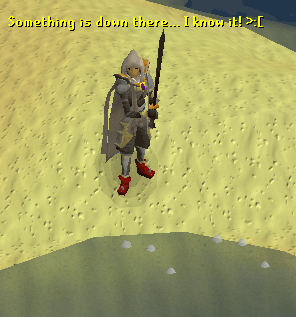 Drops several different items and a 100% drop of bones. Nothing too special to kill these for.